When we think of the incredible and intense bond we share with our pets, it is unsurprising how much their loss can prompt feelings of utter devastation and grief. For most of the animal-loving UK, pets form part of the family and when they pass away, the emptiness they leave behind can be felt as hard as if they were fellow humans. But for those who don’t have animals, understanding the intensity of someone’s grief over losing ‘just a pet’ can be difficult to comprehend. Devaluing the loss can often make the complicated grieving process a lot harder for the person involved, as they may feel ashamed or awkward about their sadness. But it is important to remember that grieving for anything you have loved and lost is completely appropriate and should never be met with judgement from others or your own feelings of embarrassment. When a beloved animal dies, everyone will cope differently and sometimes as much sorrow will be felt for the death of the animal as for the death of a human. After all, pets are the family we choose for ourselves. For healing, it is worth being completely honest with yourself and allowing yourself to express your grief without repressing or ignoring it. Don’t let anyone tell you how to feel as only you will know how much your dog, cat, horse or rabbit meant to you and how much their absence affects your life. Sometimes the best thing you can do is seek out others who are going through the same thing and are mourning the loss of a pet. They will be better able to understand the magnitude of your feelings and assist you through the grieving process. There are many pet loss support groups, forums and message boards online, so consider utilising them as a means of help. Even if you just end up talking through your emotions to an empathic ear or swapping stories of the happy times you and your pets spent together, it can really help assuage feelings of desolation and guilt. As with humans, the circumstances of death often have a huge bearing on the emotions we are left with and our ability to grieve and cope. Sometimes, picking at the flesh of your grief is the only way to properly make sense of your loss and move forward. Simple rituals like holding a funeral or burial service can really help in the early stages of grief by giving you the opportunity to openly express your sadness and lay your dear friend to rest. In the long-run it will also give you somewhere to go whenever you are sad or want to feel close to your pet. Some people like to plant a tree, leave a plaque or compile a scrapbook full of memories. For many people, when a beloved animal dies, meaning and joy is temporarily sucked from life. It is important to find this again and seek something else to be optimistic about. This is easy if you have other pets to focus your energy on and family members to support you. Stay connected to friends, consider taking up a new hobby, volunteer, join a club or class, get active and generally take good care of yourself. Remember that grieving is completely natural and completely personal and there is no set time for when you should ‘be over it.’ Take as long as you need and reach out to as many people as possible for advice and support. In time, the bittersweet memories and gratefulness for the times you spent will replace the over-riding realities of your loss. 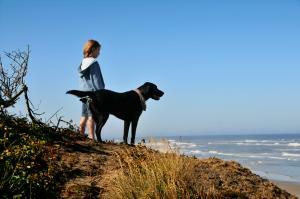 Thank you Hannah for the caring post about how to cope with the loss of your pet. My 19 year old cat Muffin died a few weeks ago and I am finding it very difficult to get over the loss. I find myself quite lonely without him as he was always nearby. Your words helped. Best wishes. Jean. My dear rescue dog Murphy died just over two months ago. He was nearly 17 and had been with me for just over half his life. Since my husband died two and a half years ago he has been such good company, security, love and he made me go for walks! I miss him for all those things now. he was part of my life with my husband so it has been especially hard losing him. A double grief and I lost him at a time when i was not well either following a fall and fractured wrist. I'm now volunteering with the Cinnamon Trust to do some dog walking which will help I hope. Lindsay cook,I am really sorry to hear about your "Lady" ,now she's gone to the other side. I also have a georgous BC called "Sam",although he's only going to be 8yrs on 29th Sept. I am a member of a few BC groups on Facebook and it's very hard reading some of them,I even get anxious & scared at times,even though there not even BC's I know personally, I have no idea of the loss your suffering,Since I was made disabled in a bad crash & can no longer do my Zookeeper/Zoology work due to injuries & internal organs not functioning properly, this happened when Sam was 5months old. I consequently trained him myself to help me in/out of my bungalow, I also now get blackouts & I trained him to raise the neighbour or try wakening me up,by licking my face,pushing his paws into my ribs or go out to the garden and bark continuously till someone comes !! He also can go in & out to the garden when he wants as I attached canvas straps to all doors in the house,he goes out and round to the back where there is a large bit of wild land with heather,ferns etc,he'll do his business,comes in and closes the door again,there's dozens of other useful chores he can do,quite amazing as sometimes does a thing I didn't even teach him to do !! The reason I'm telling you this is,we live alone just me,Sam & Charlie (my cat) and I'm with him 24/7, I also have a large mobility scooter trike(25-30 miles) on a full charge and Sam runs along side for miles & miles and he loves it. Sorry it's very long,so when the time comes when he's older,I really don't know how i am going to be able to get through that as I love him dearly (more than humans),it's extremely frightening the thought of it !! I sincerely hope that you are doing well and that you have a way of how to get through it (not just now) but later when you feel up to it,just incase I need any tips in the years to come. Thank you for your article, it was very appropriate as today I had to make the dreadful decision every pet owner has to make, the decision to put one of my cats down, Sophie had been living on borrowed time for a long time now, at 17 she had renal disease,deaf and had itchy skin and was just a bag of bones but still eating and plodding around. I had noticed she wasn't as happy as usual this past week, was being sick, off her food and just staring off into space. RIP little one. I lost my two 16 year old cats, Baghira and Schnecke, last year and I am still struggling with depressions and sadness about their loss. They were brothers and the moment I saw them als little kittens I fell in love with them. I moved from Germany to the UK and had to leave them with my mum for 5 months (which where hell) and was more then relieved to bring them finally over the channel , which was another battle of paperwork and problems. During their last year, both their health went rapidly down and Schnecke was diagnosed with failing pancreas and kidney while his brother Baghira had problems with his stomach that couldn't process the food anymore. One day, when I was the first time not at home but with my partner out at work, Schnecke decided to run away. The moment I can come and found he wasn't there I knew that I would never see him again. It still haunts me and I still feel guilty to not have been there that day to prevent him from going. Two months later I had to let my soulmate Baghira go since he was too weak to walk and I just couldn't let him suffer any longer. That was by far the most difficult decission I ever had to make in my whole life. His ashes are now on my desk. The box he came in is wrapped with his favourite sock he loved to carry around. Send all of you who have lost their beloved companions big hugs.